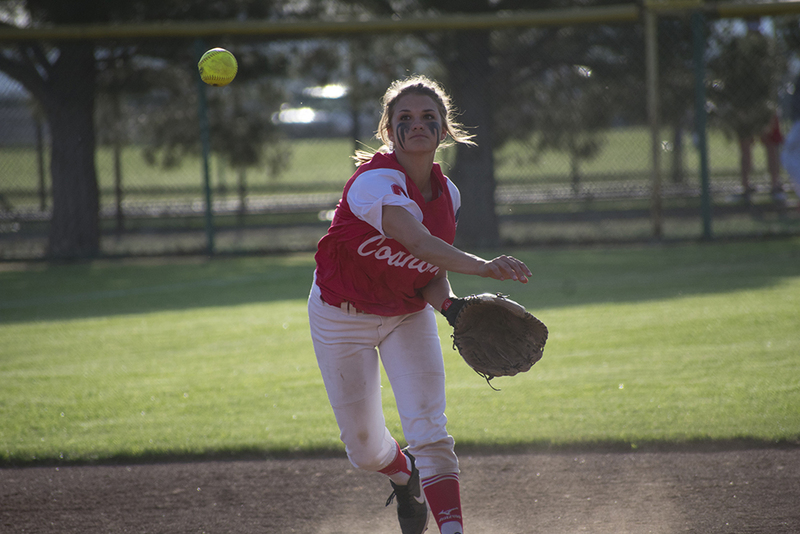 MERKEL — The Bulldogettes picked up their third straight win with a big eight run, sixth inning in their district match against the Merkel Lady Badgers on Tuesday night, 11-3. The two teams were tied going into the top of the sixth inning when Kaylor Green singled on a 2-0 pitch for an RBI which got things hopping for Coahoma. Singles by MaKynlee Overton and Alex Bailey also brought in RBIs for the Bulldogettes. Coahoma also took full advantage of Merkel’s errors in the sixth. Lexi Montelongo, Bailey, and Madison Rodgers all crossed home plate off of errors. Overton led the Bulldogettes at bat. She went 3-for-4 with three runs, two RBIs, a double, and a home run in the fourth inning on a flyball to center field. She also threw three innings as relief and struck out six batters. Cailtyn Corley was 2-for-4 with one run and one RBI. Montelongo belted a double and had two runs and Macee Grant scored two runs for the Bulldogettes. Cassie Grant led Coahoma to victory on the mound. She went four innings suffered five hits and two runs while striking out two. C. Grant threw 74 pitches and earned 43 strikes. The Bulldogettes went wild on the bases stealing 10. Overton, Montelongo, M. Grant and Rodgers stole two each. Next: Coahoma (10-4, 4-2) host No. 11 Clyde (17-4, 6-0) at 5 p.m. on Friday. W — Cassie Grant, L — Dalyce Falfar. 2B — Coahoma — Lexi Montelongo; Merkel — Macy Jones. 3B — Merkel — Kaile Baker, A. Navarrette. HR — Coahoma — MaKynlee Overton. SB — Coahoma — Overton 2, Montelongo 2, Macee Grant 2, Madison Rodgers 2, C. Grant, Kaylor Green; Merkel — A. Navarrette 5, N. Olece 2. Pitches-Strikes: Coahoma — C. Grant 74-43, Overton 39-30; Merkel — Falfar 103-50; S. Brown 8-5. Batters Faced: Coahoma — C. Grant 19, M. Overton 13; Merkel — D. Falfar 31, Brown 4.